I went with my family to Sayulita, Mexico for a long overdue vacation and I thought I would have plenty of opportunity to catch up on writing a bunch of long overdue posts. But the second — literally — I exited the airport into the incredible sultry warmth of the evening sun, that intention evaporated very quickly. Going from a recent hailstorm a few days before in Seattle to a 30-degree temperature increase makes you forget a lot. 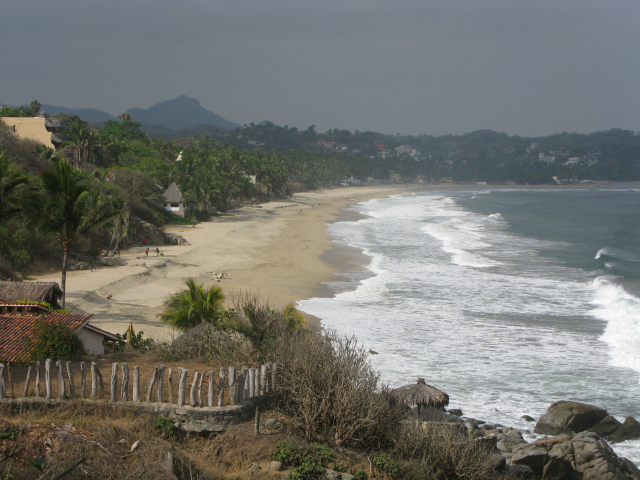 We spent a glorious six days in Sayulita completely de-stressing. And my friends who know me well would agree that it takes that amount of time or more to successfully eliminate any amount of stress in my body and mind. I also replenished my vitamin D stores which had reached dangerously low levels, a very common thing among us Pacific North-westerners. And, having that public health training still embedded in my brain, I know all about how bad the sun is for your skin and believe me, I loaded up on the suntan lotion. But because of the amount of time I spent swimming in the ocean in Sayulita, it was impossible not to get baked. Within a day of taking up residence in our very basic one-bedroom bungalow right on the beach (there was a loft for the kids), Ruby the iguana started hanging out with us. The kids decided Ruby was a female. They were fascinated about how to discover the gender of an animal. There are tons of dogs running around Sayulita and it is very clear which ones are male and which are female– I had to explain what castration was at one point (the “ewww’s” were quite loud). One day there was a cat who came to visit us while we were having dinner out one night and I had to explain how you can tell whether a cat is a female or a male. All you have to do is look under the tail for the “upside down exclamation point.” As a cat lover all my life, although becoming less so after I had kids, I know certain facts about these animals that may not be common knowledge. Ruby provided a source of comfort for the kids- our cat had just disappeared last month (his sister had died the year before) and one of the kids was still in mourning. We had a good time trying to find her perch on the beautiful fuschia bougainvillea vines each day — she would change positions depending on the time of day (we think she would move to a cooler spot during the hottest part of the day- it would get to the low 80s). As you can tell, Ruby was bright green and blended in extremely well with the vines so it took some searching to find her. We talked about the benefits of being a chameleon and how that could apply to people as well! We visited an iguana sanctuary right in the center of Sayulita. 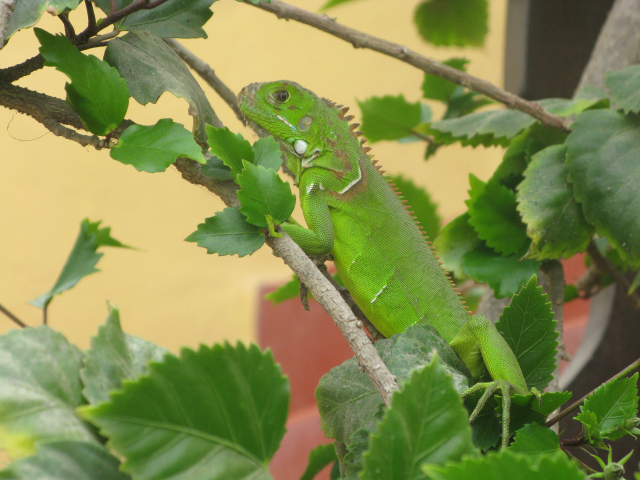 We counted at least 6 iguanas at one time but there were more hiding up high in the trees. One of the tourists we ran into as we entered the sanctuary told us he learned from staff there that often an iguana would be snoozing, fall out off the tree branch, land on the ground, wake up in a daze, and when it realized where it was, would very quickly scuttle back up the tree. He gave a great imitation of a confused iguana. The one time we ate breakfast out was at a restaurant that caters to “gringos” and is run by an American — we usually like to patronize the Mexican eateries but this time we decided to make the kids happy with their favorite comfort food: pancakes. This guy, Rollie, was in his late seventies and he had a whole page on the menu devoted to his “story”. 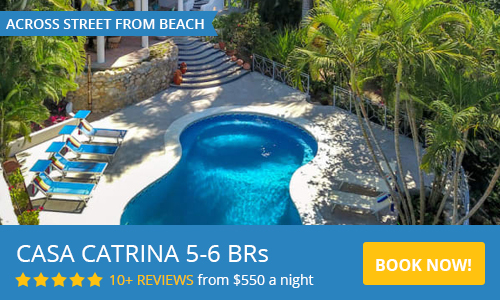 And that, in a nutshell, was about how he vacationed here in this little Mexican town years ago and fell head over heels in love with Sayulita and decided this was where he wanted to retire. Rollie had been a school principal in Monterey, California, and always had a dream of opening a restaurant and this sleepy little town was the perfect place for it. I was struck by his determination to make it happen even though he knew zippo about the restaurant business. He just knew he wanted a place that created a sense of community. And it certainly had that — a bustling, welcoming feel, and Rollie knew many of the customers! The kids drew pictures and when they were done, Rollie held them up and shouted in a deep baritone voice, “Ladies and Gentlemen! Kid #2 has drawn a very special drawing and my favorite thing about this drawing is that it is called “Goldie the Rainbow fairy!” and the restaurant patrons broke out into cheerful applause. Kid #2 had the biggest smile. And Rollie did the same thing for kid #1′s drawing. A huge victory: the kids swam in the ocean! 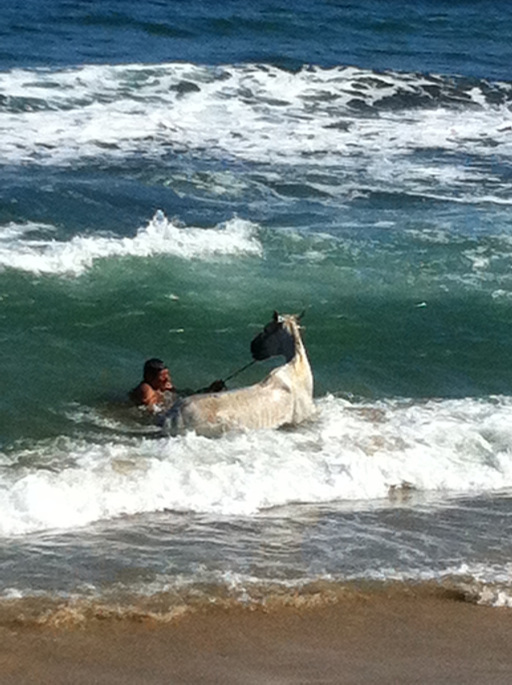 I had been trying to get them into the ocean to teach them how to navigate the waves which were totally manageable. Kid #1, who is older, was resistant from day 1. On the second-to-last day, I marched into the bungalow, dripping wet from my swim (husband was prostrate in bed with heartburn from too much spicy sauce on his tacos the night before and the kids were reading), and insisted the kids come swimming with me. They reluctantly got their bathing suits on, their whines getting louder by the second. Plopped themselves onto the beach like they were never going to get up again. I took kid #1′s hand, tried not to have a bad mother moment, and practically dragged the reluctant body to the edge of the water. I demonstrated as carefully as I could how to get in without being swallowed by a wave. This beach had a shallow trough in the sandbar which you had to step into but once you are there, is a great place to float and rock with the waves. Eventually after much pleading, kid #2 inched towards me, held on to me for dear life, then gradually let go and pretty soon was happily bobbing up and down with the waves. I taught the kid how to dive under the waves and once that finally happened, her outlook had forever changed. Kid #2 soon followed suit and even though I had to watch this one more closely, was soon happily playing in the waves. Still no head under water, but I still believe it was a major victory. You could totally see their self esteem ratchet up several notches! It was bittersweet — somehow it felt like something was falling into place, like a puzzle piece framing the separation that eventually happens between children and parents.